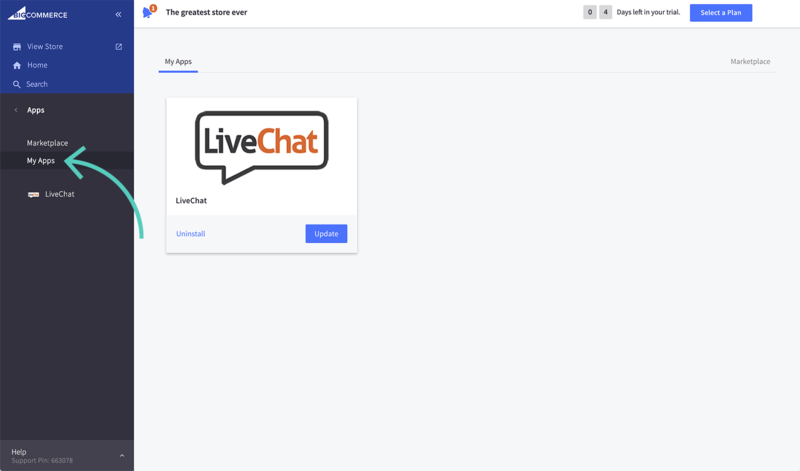 This app is installed by default when you add Livechat to your BigCommerce store. 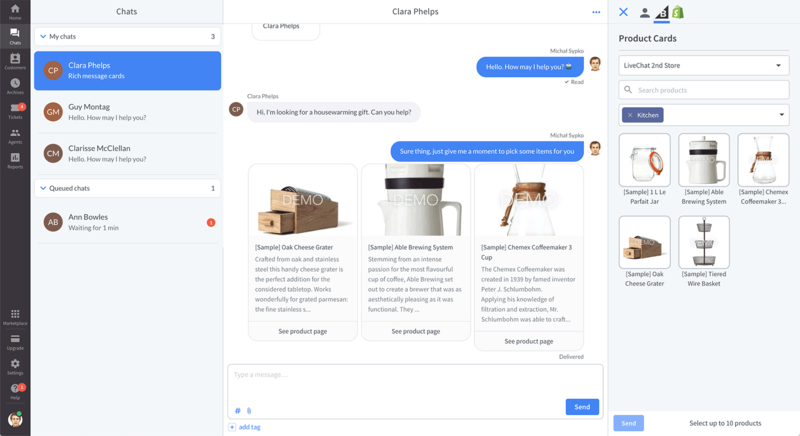 Product Cards for BigCommerce app lets you send product recommendations without leaving LiveChat. Allowing you to save time on skipping between chats and product pages in your store. 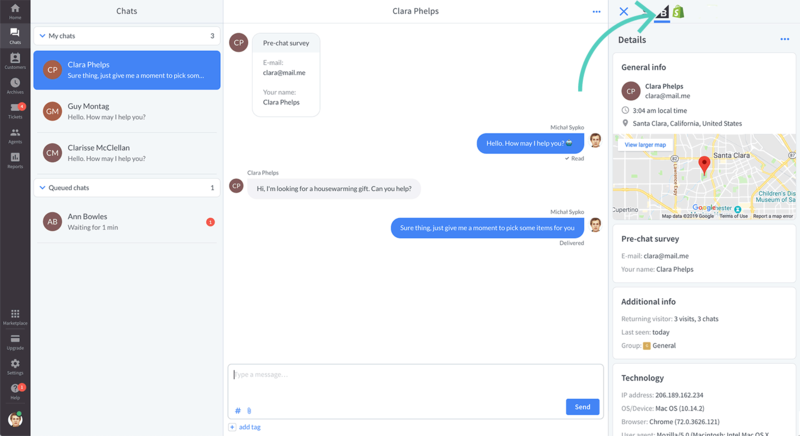 You can search through products, choose one or more items and send them to the customers right on chat. Each product card consists of an image, description and a button that is linked to a product page in your BigCommerce store. To open Product Cards for BigCommerce in LiveChat you need to have at least one ongoing chat. Open the app by clicking on the BigCommerce icon. You can find it in the Chats section, at the top of the details bar on the right. Can’t see the app? Go to troubleshooting. Choose a store you want to selects products from (if you have only one store connected to LiveChat, you won’t see this field). Type the product name in the search bar to narrow down results. You can also choose a category. Click on the products you want to send (you can select up to 10 at once). If you want to unselect a product click on it again. And that’s it. Product cards you’ve sent are displayed both on the customer side and in the Chats section in the Agent App. You’re not using the new chat widget yet. 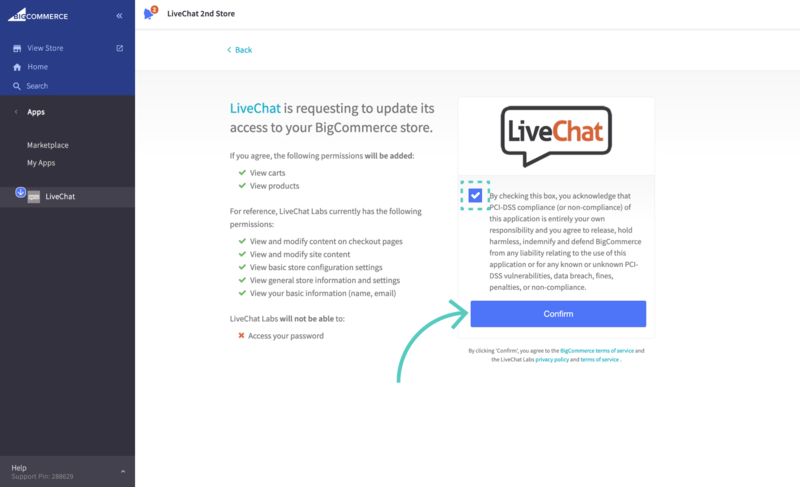 The LiveChat app in BigCommerce is not up-to-date. Below you will find short tutorials on how to fix these issues. If you need any help, talk to our Support Heroes. To use this app, you need to switch to the new chat widget. Head to Settings → Chat widget → Customization and click on Discover the new look. Confirm by clicking on the Save button. Find LiveChat app and click on Update.